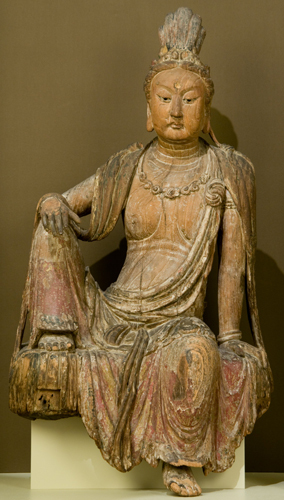 This aspect of Guanyin, enthroned on his legendary mountain abode, Potala, was especially favored in China during the 12th and 13th centuries. The figure is seated in a position of Royal Relaxation. Its rustic base, visible at the left, symbolizes a rocky ledge of the mountain paradise, from which Guanyin beholds with sublime compassion the sufferings of earthly beings. Public temple images such as this, gilt and richly polychromed, were often installed in an elaborate naturalistic setting. They combined the two concepts of the immutability of the Divine and the transitory nature of the world.